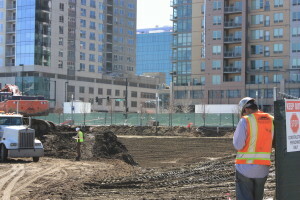 Union Tower West broke ground today at 1801 Wewatta in Denver's Union Station neighborhood. Members of the development team and the City of Denver were on hand. The developer for this project is Portman Holdings. The general contractor is Hensel Phelps and the architect is Joh Portman & Associates. 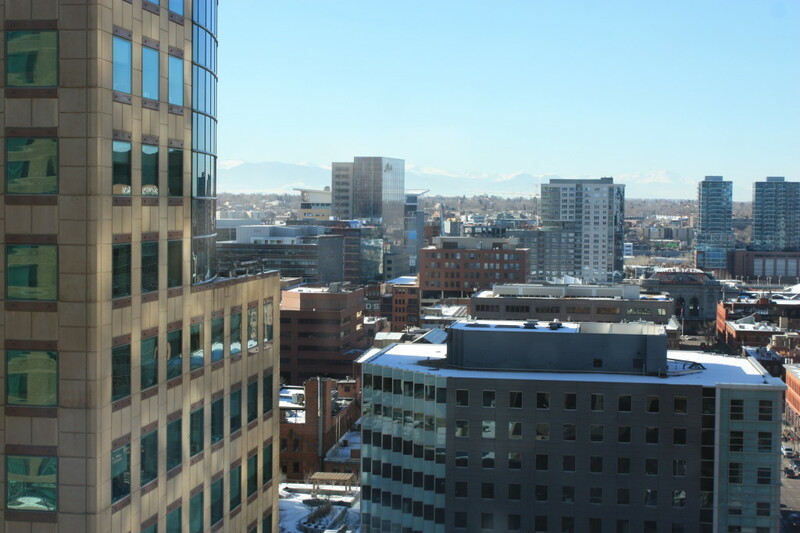 Denver Mayor Michael Hancock welcomed the Union Tower West project to the Mile High City. "We are excited about this project, the new Hotel Indigo, and the office project that will accompany it. 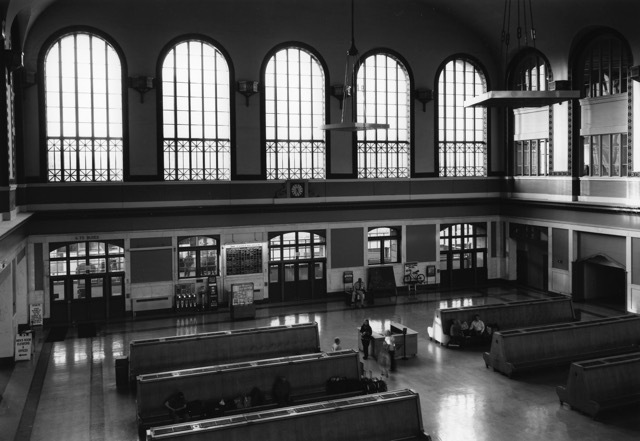 This is the type of project we envisioned when we decided to redevelop Union Station and make it the hub of our transit system," said Hancock. Denver Mayor Michael Hancock, President & CEO Tami Door of the Downtown Denver Partnership, along with members of the development team break ground on Union Tower West. 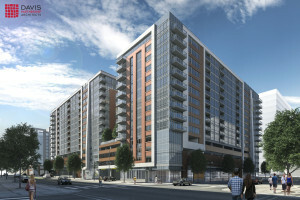 Rendering of Union tower West with Indigo Hotel pictured. Image courtesy Portman Holdings. Above Hotel Indigo will sit 100,000 feet of Class A office space. Opportunities for food and beverage concepts are available in 10,000 square feet of featured retail space. 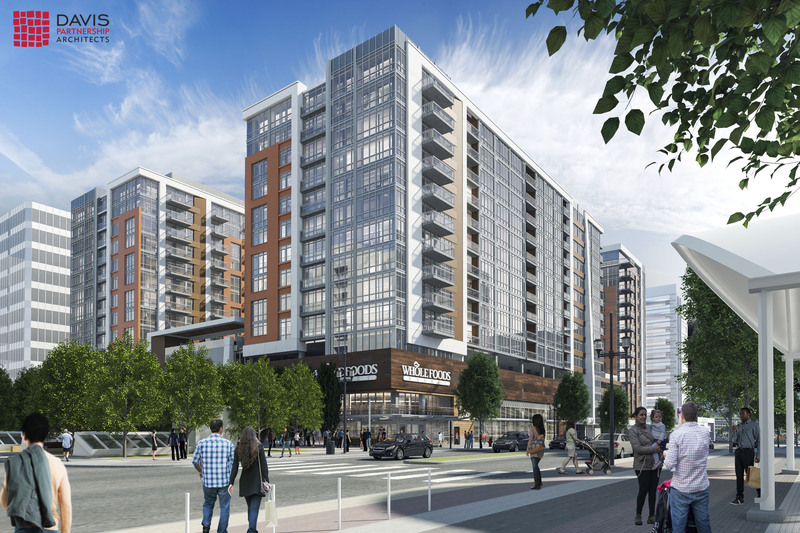 Union West Tower will be constructed on the block that is located just to the northeast of the 17W residential and retail development that just broke ground a few weeks ago. 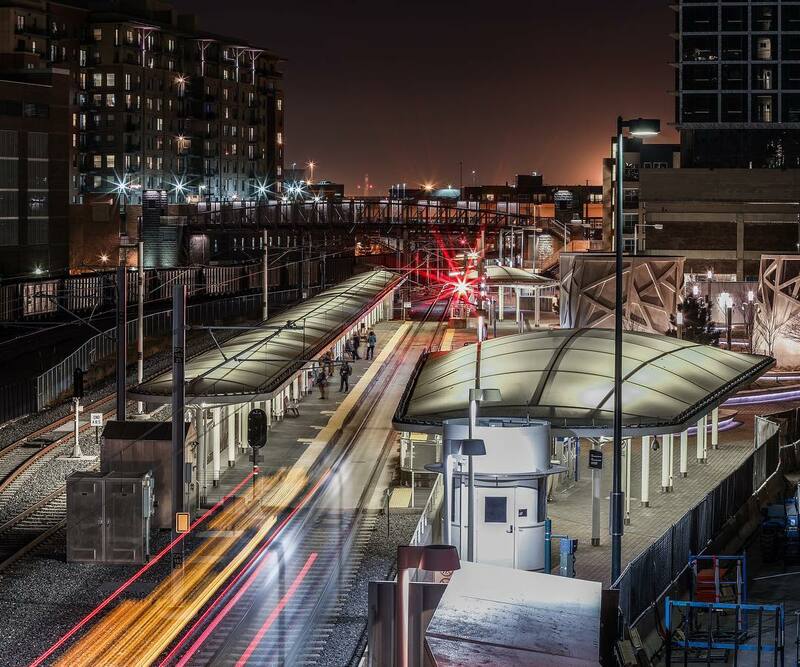 Denver’s Union Station, the transit hub of the front range population corridor is located just a block and and half away from this development. 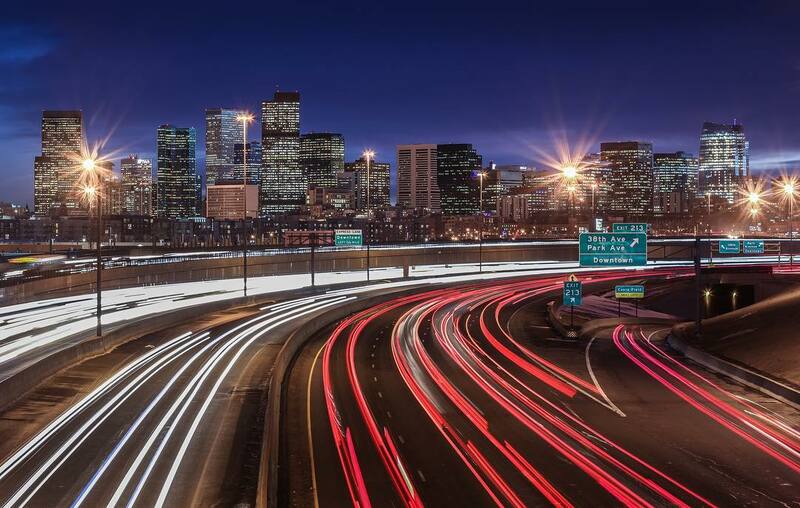 RTD commuter rail service to Denver International airport will begin in 2016. 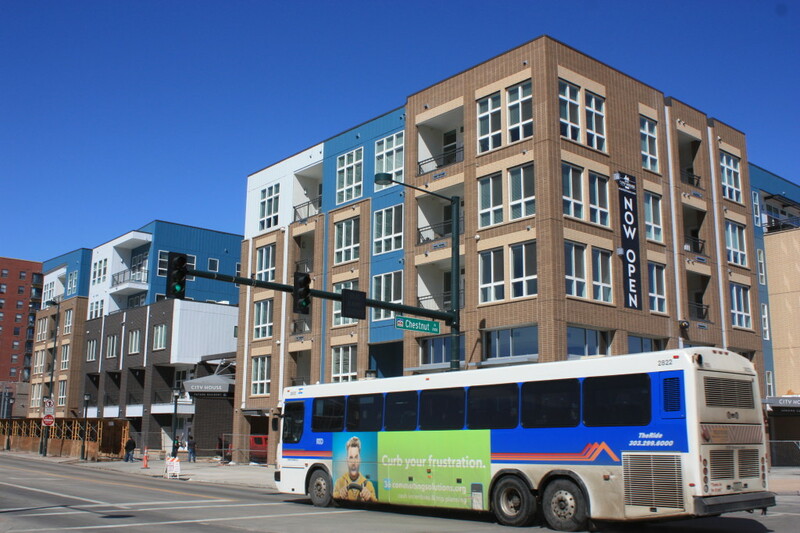 A RTD light rail station sits adjacent to the Union West Tower site with current service and connections to Denver’s west, southwest, and southeast suburbs. 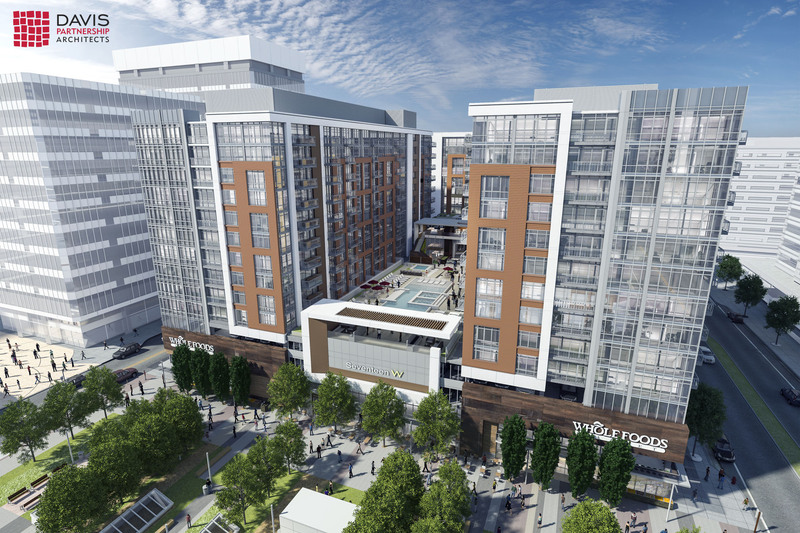 Rendering of Union Tower West with Indigo Hotel. Image courtesy Portman Holdings. 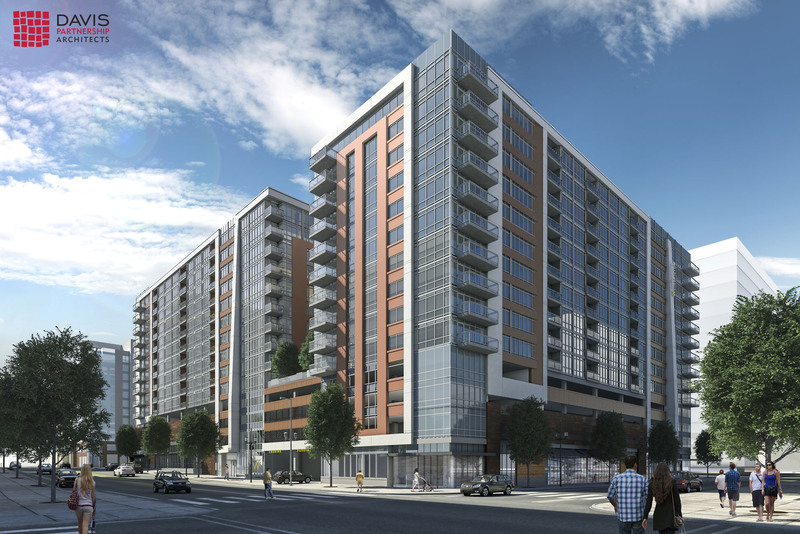 17W with Whole Foods shown in this rendering courtesy Davis Partnership Architects. Rendering of 17W courtesy Davis Partnership Architect. 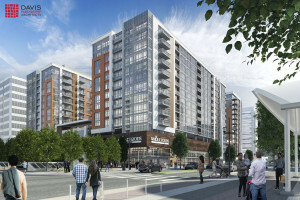 Rendering of 17W in Denver's Union Station neighborhood. 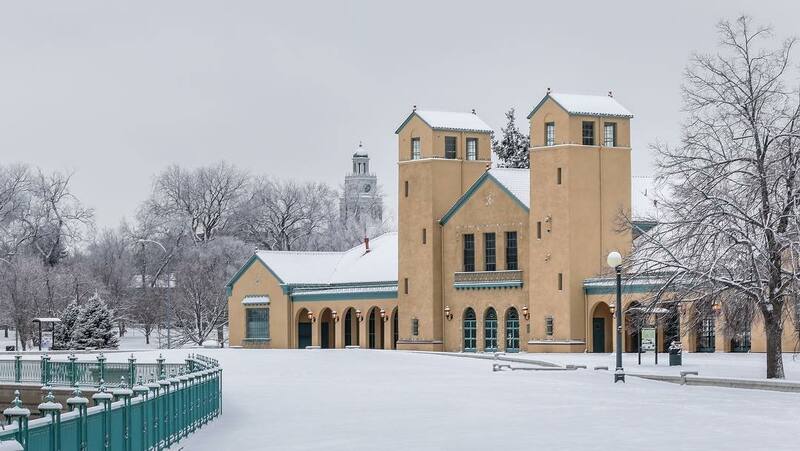 Image courtesy Davis Partnership Architects. 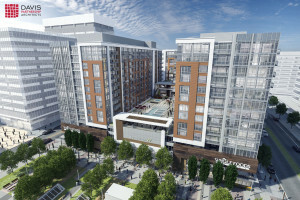 Davis Partnership Architects has announced that construction is now underway at the 17W site in Denver's Union Station neighborhood. This mixed-use project will include 600 residential rental units housed in three 13-story towers and space for ground floor retail. Davis Partnership Architects has joined with Holland Partner Group to design and develop this structure. A Whole Foods grocery store will anchor the 60,000 feet of available retail space at 17W. Residential units will be offered in studio, one- and two-bedroom apartments. Penthouse residences will be available on the upper two floors of the towers and will range in size from 1,000 to 3,000 square feet. 17W will take up the entire block bordered by 17th Street, Wewatta Street, 18th Street and Chestnut Place. 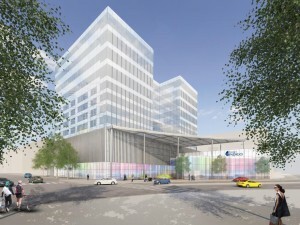 The structure will rise one block away from Denver's transit hub Union Station. "The three towers embrace an outdoor courtyard peppered with lush landscaping, gathering spaces, whirlpools and a swimming pool. Adjacent to the courtyard, a large interior amenity zone will house fitness spaces, community spaces, kitchens and bars, conference rooms and a business center, along with a myriad of large and small lounges. Inviting residents to spend time enjoying their community and getting to know their neighbors," states Davis Partnership Architects. 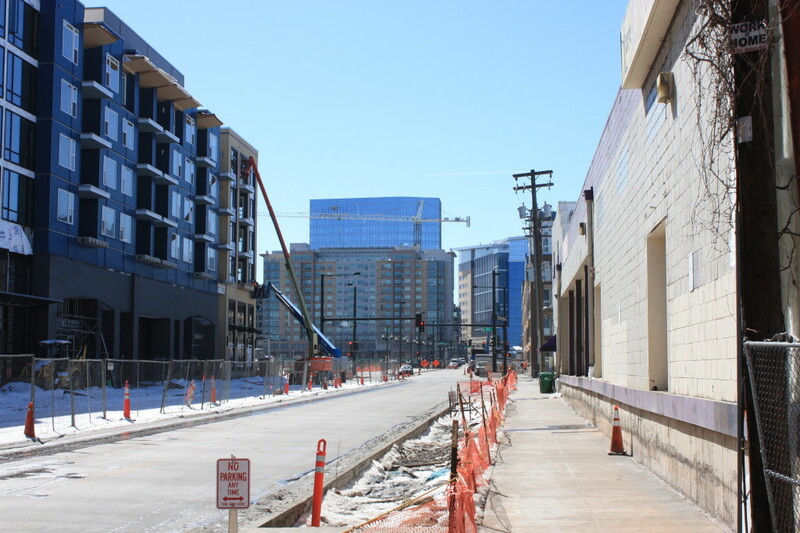 The Whole Foods will be located on the ground floor and will stretch along the entire 17th Street side of 17W. "The store is designed in a non-standard way, opening up to the street across much of its frontage and thereby allowing a more transparent, accessible and interactive pedestrian experience, "explains Davis Partnership Architects. Space for restaurants and dry goods retailers is available as well. Access for loading and services will be hidden from view of residents and neighbors and are located internally. Parking will be available below and above and is slated to be available for residents and shoppers alike. 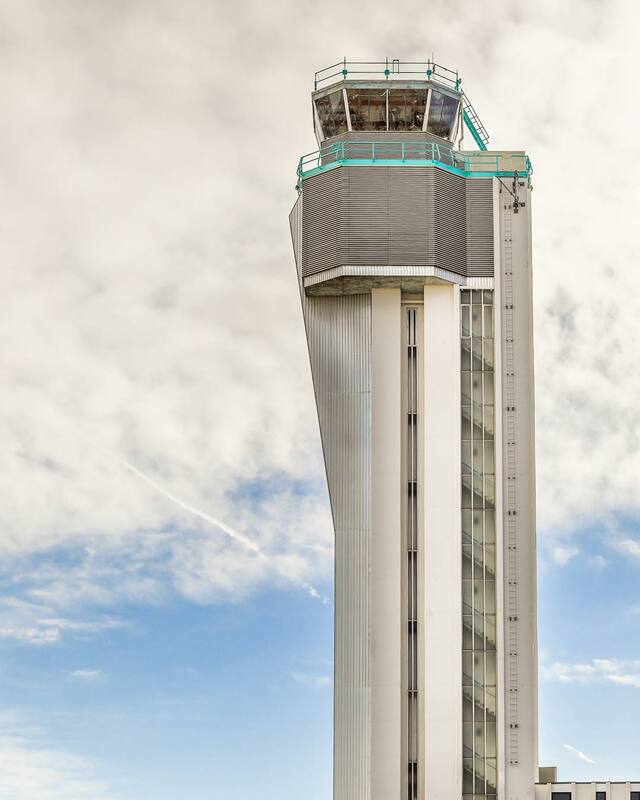 17W is expected to be completed in late 2017. "People have told me you need to go to New York, you need to go to these other places, and I photograph where I live. 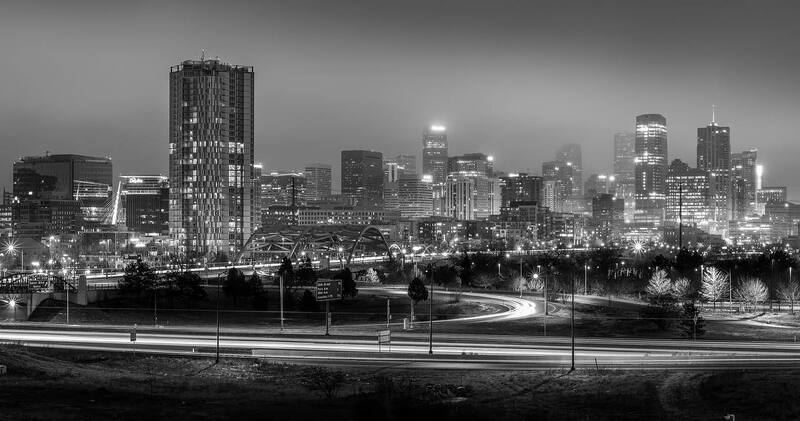 I love photographing Denver. I don't need to go to other cities. 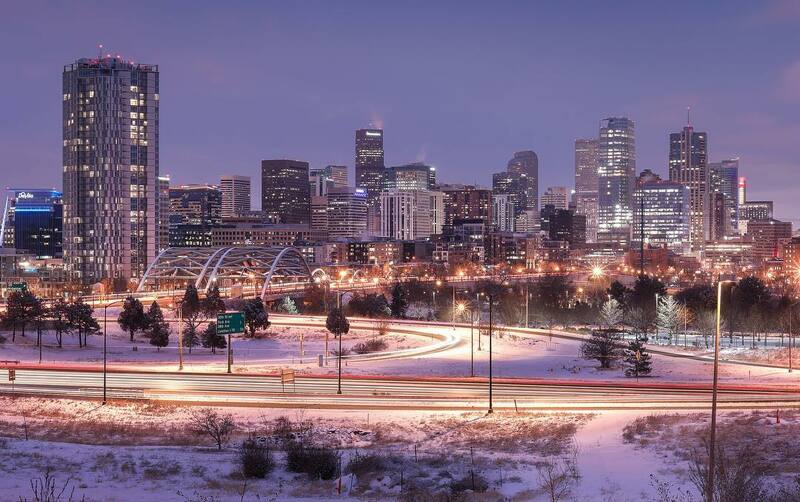 Denver was right in front of me," proclaimed Denver photographer Gifford Ewing. An unassuming photography studio sits just east of downtown Denver at 800 East 19th Avenue. 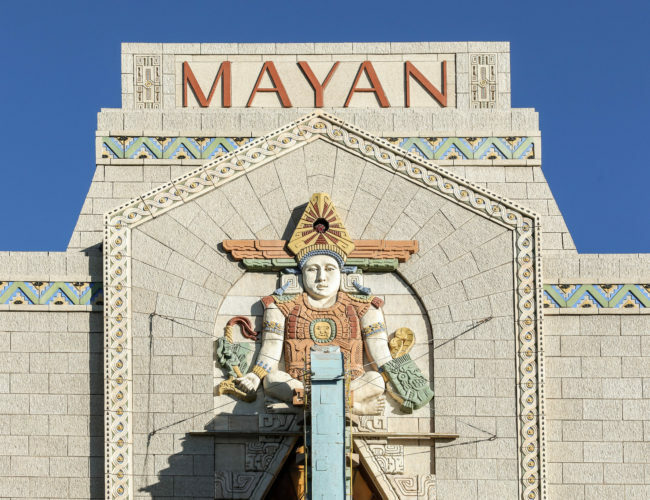 The building in which this studio is housed has been witness to Denver's booms and its busts. A building that has been home to a laundry mat and a grocery store. Photographer Gifford Ewing purchased the building that would become his studio in the early 1980s when the area was referred to as North Capitol Hill and bullet holes could be found imprinted in the adjacent buildings. Today Denver locals refer to this neighborhood as Uptown and the bullet holes have faded away. Now Ewing's studio is in a hip and gentrified neighborhood. 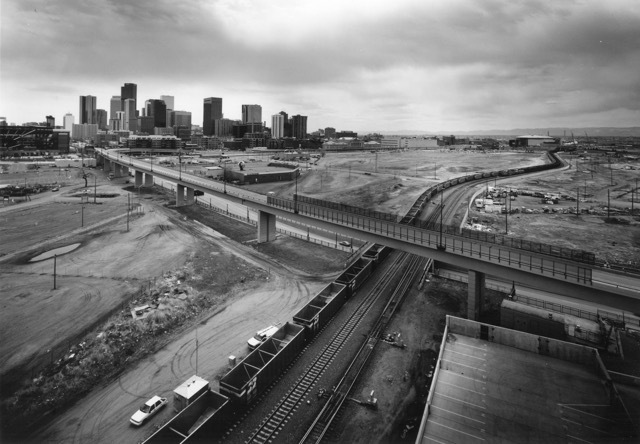 Although Ewing without hesitation identifies himself as an artist as opposed to journalist or a documentarian, his photographs of Denver have showcased the tremendous changes that have taken place in the Mile High City in recent decades through his photographs. Denver's Union Station 2010 Ewing Photography. 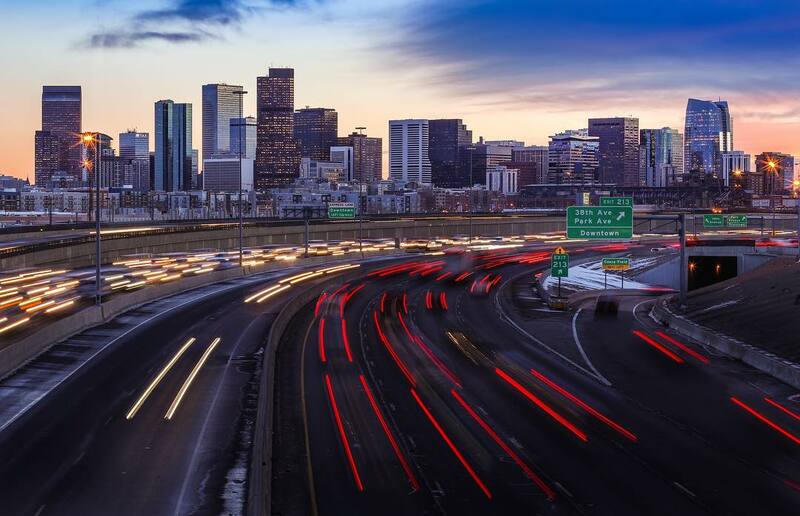 I sat down with the warm yet low-key coffee sipping Ewing at his studio to learn more about the photographs he has captured of Denver in advance of his Size Matters? 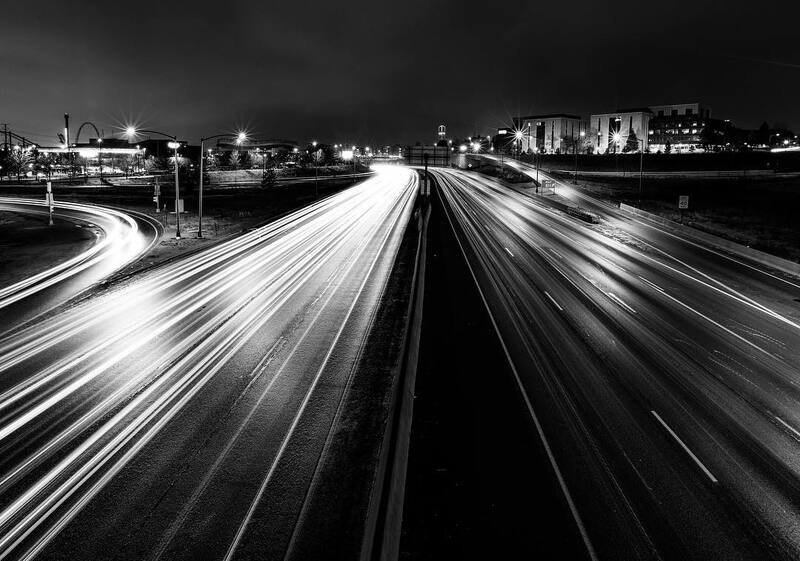 photography opening reception that will be held at his studio at 5pm on April 2nd showcasing 5x7 foot prints of his work. Before I asked any questions he picked up a black and white photo of a cowboy that on first glance could have been from the 1880s. Ewing explained that he saw the cowboy that he would photograph riding along a road in Arizona near the four corners area. Ewing pulled over and began to chat with the cowboy. It turns out the cowboy was ridding from Ontario Canada on a six thousand mile ride to Mexico to raise money for an orphanage in Cambodia. The first time Ewing bought a camera was when he was stationed in Thailand while serving in the Air Force during the Vietnam war. "Strangely enough I was so against the war that I did not take very many pictures," said Ewing. After the war Ewing, a native of Rhode Island, relocated to Denver and set up a dark room in a little house that he purchased near Washington Park. After a few years of shooting commercial photography and shooting aerial photographs for an engineering firm, he bought his current studio. "In 1990, 91, 92 I had this incredible desire to get back into the black and white art. 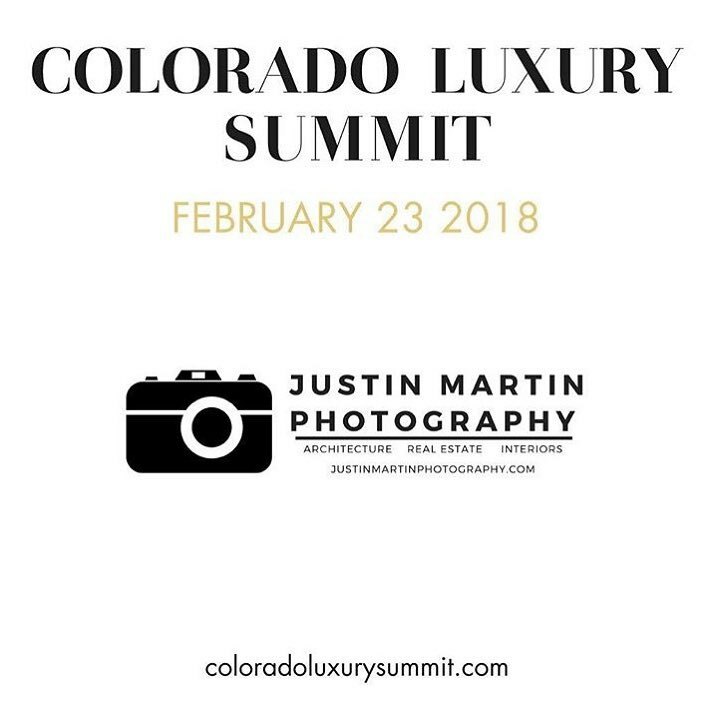 My whole focus went into the black and white world of art and I weaned myself away from the commercial advertising world and that is when I started building my portfolio of Denver," explained Ewing. Platte Valley Rail Yards. Ewing Photography 1999. The bulk of Ewing's photographs have been captured in black and white using a 5x7 Deardorff wooden field camera utilizing the zone system for exposure. To develop the prints, he utilizes techniques that date back to the 19th century. 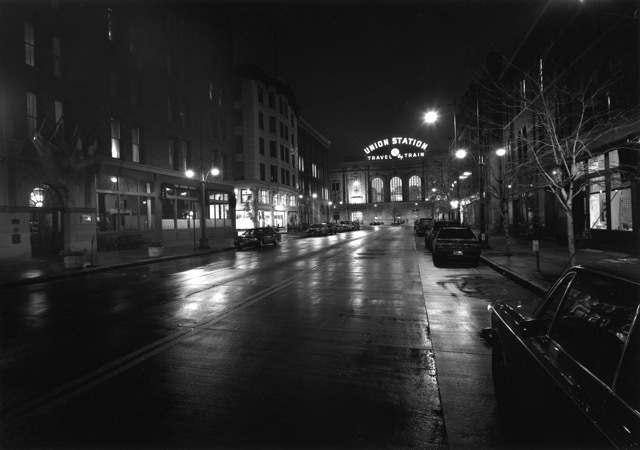 Archival silver gelatin paper is used and finished with selenium to bring out the richness of the image. 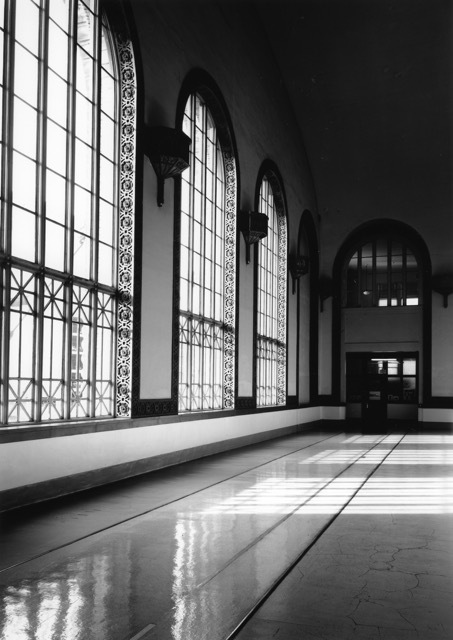 Ewing never had any formal training or education in photography. He is entirely self- taught. When asked why he has not transitioned to digital photography Ewing explained, "People think that I am kind of nuts. It is more cumbersome, it is more stuff to carry, you can't shoot as fast, and you are done once you reach the end of the roll, but I just love my environment of the world of film." 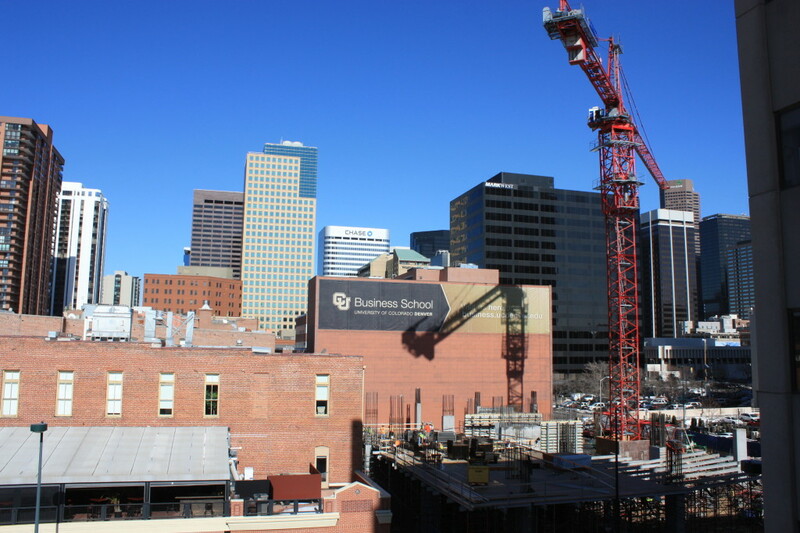 Ewing has witnessed and captured the changes that have taken place in Denver particularly in the LoDo and Union Station neighborhoods. 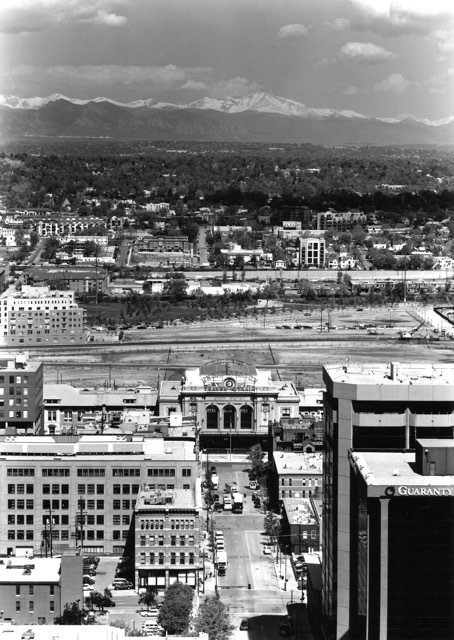 Denver's Union Station and Long's Peak. Ewing Photography. 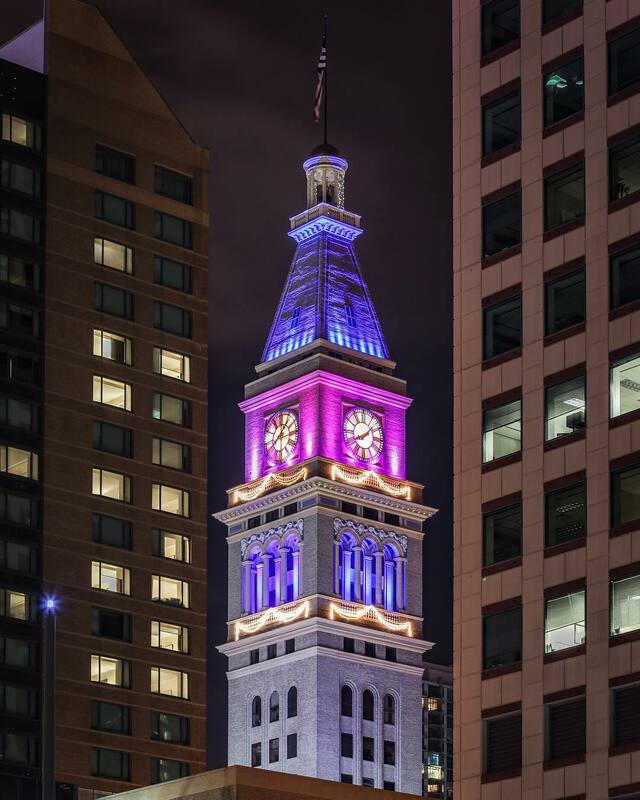 Ewing has collaborated with award winning Denver preservationist Dana Crawford who is well known for spearheading the preservation of Larimer Square. "I was asked by Dana Crawford when she did the Flour Mill Lofts, to take some photographs and now those are hanging in the Flour Mill. She told me about the Flour Mill project and it was sitting out there as this hulk in the rail yard. I shot on and off for a week and a half and the rail yards and all that stuff was still there, but the Platte Valley was empty. I want to go back and shoot it. 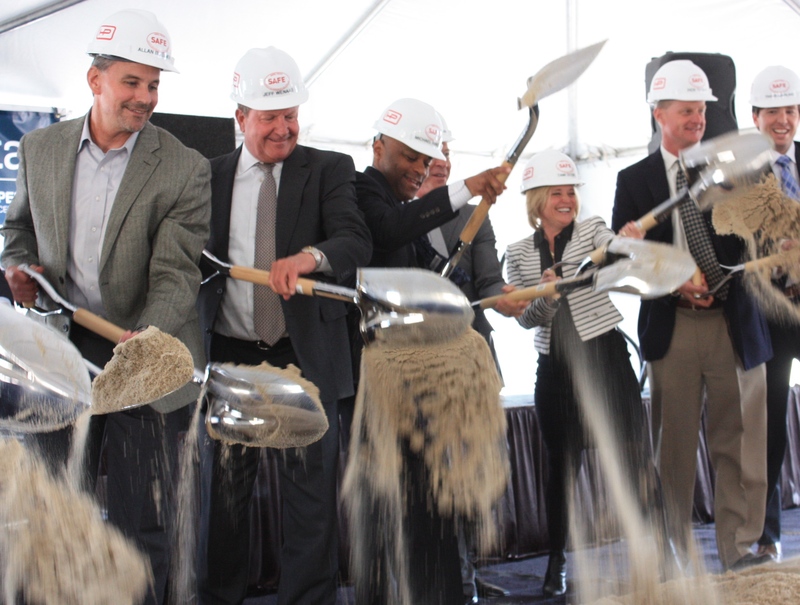 There has been so much development that has gone on," said Ewing. 17W is now under construction at 17th Street and Wewatta. The project will be apartments and a Whole Foods is slated to occupy the first floor. Alta City House located at 19th Street and Chestnut is nearing completion as an RTD bus passes by. 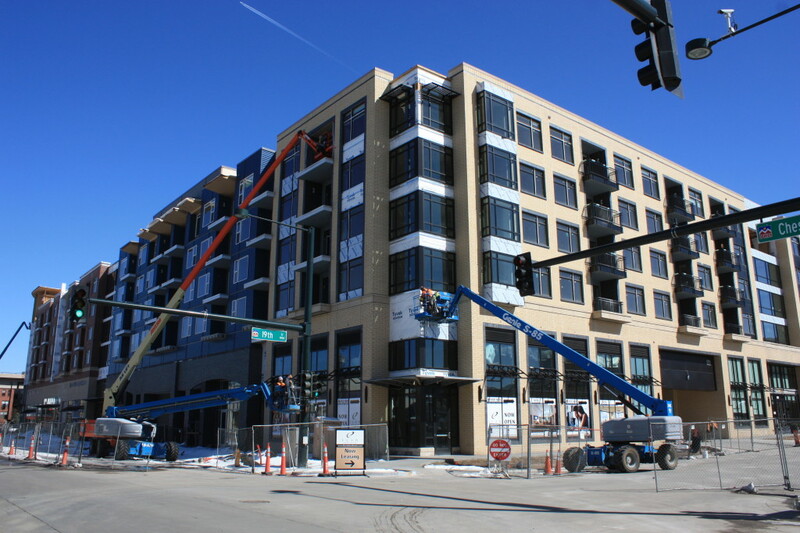 A King Soopers will be opening on the first floor of the Elan Union Station apartment project at 19th Street and Chestnut Place. The above photo looks down Chestnut Place towards the southwest. The structure that sits on the righthand side of the photo was utilized as self storage building and is slated for demolition to make way for the planned 12-story Hilton Garden Inn. 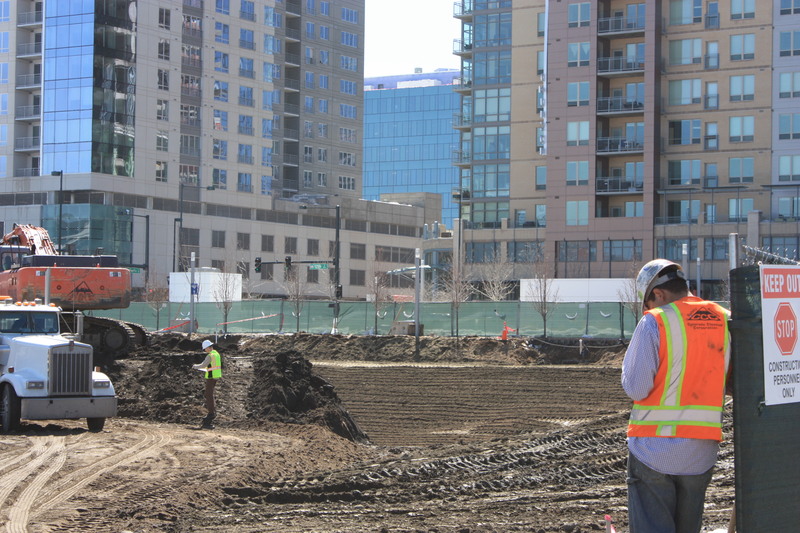 The structure on the lefthand side of the photo is northeast side of the Elan Union Station apartment project where the new King Soopers will be located. The 13-story building in the middle of the picture is the Cadence Union Station apartments. 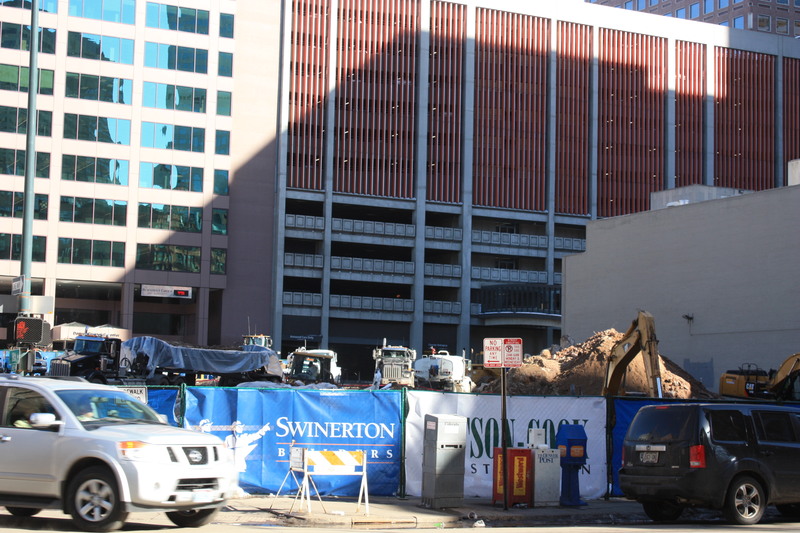 The crane is with the 1601 Wewatta office project that recently topped off at 10-stories. 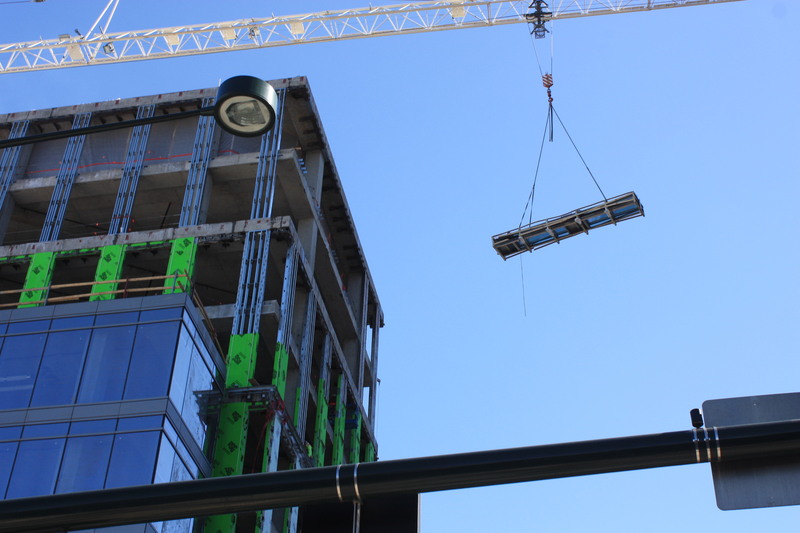 A crane delivers glass to the 1601 Wewatta office project that was developed by Hines. 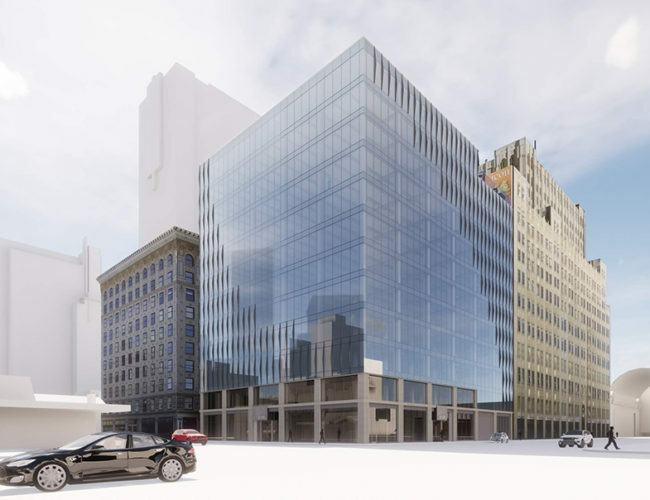 The glass has been stored in crates on an adjacent lot that is planned to become an 18-story office tower at the corner of 16th Street and Chestnut Place. Photo of 1601 Wewatta looking southeast down the 16th Street Mall in the above photo. 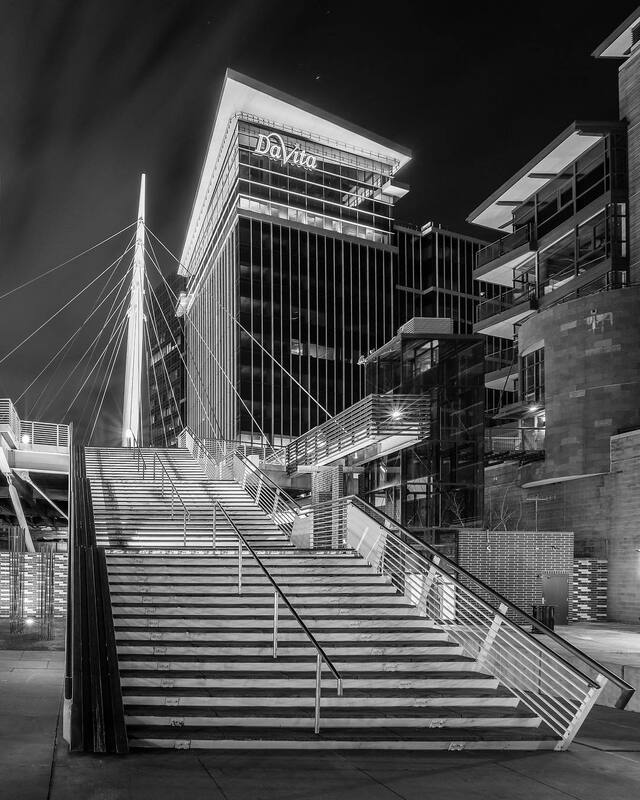 Denver's Millennium bridge is one of three pedestrian bridges that connects downtown Denver with the Highlands. 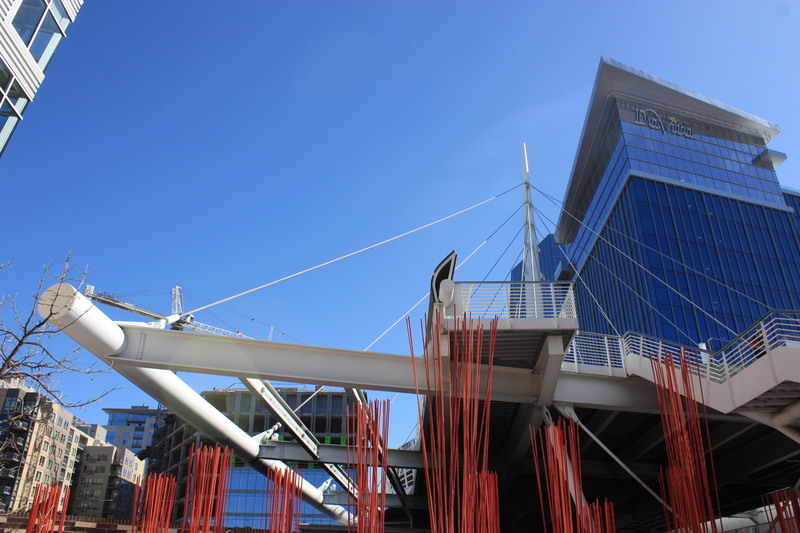 The Millennium bridge allows RTD light rail vehicles to safely pass under the bridge while pedestrians stroll above. 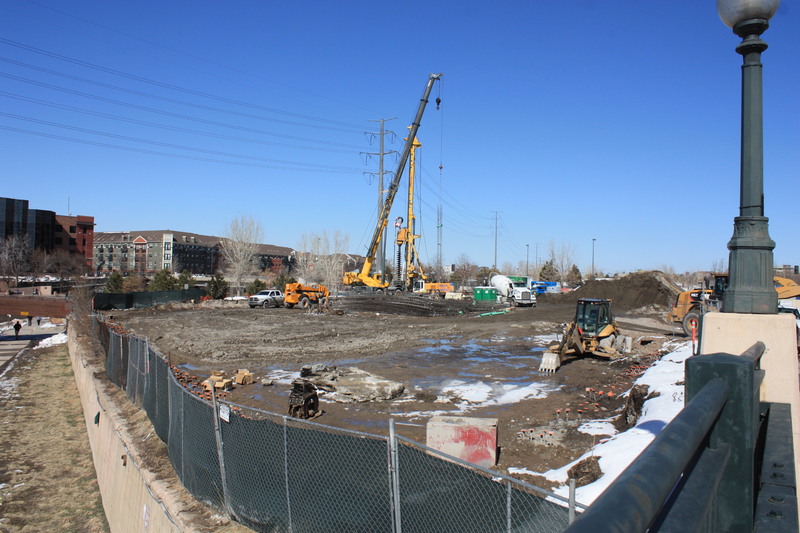 The Confluence, a 34-story luxury apartment building is under construction and if you are wondering where the name for this development came from, it is because this tower will rise adjacent to the confluence of the Platte River and Cherry Creek. This project will feature underground parking. Excavation work is underway, but a lot of work will take place before the above grade work begins. The open space between the Triangle building and the Environmental Protection Agency building (pictured on the righthand side of the photo) is where a cycling station will be located. Currently construction materials are located in the space. This space is actually the right of way for Wewatta Street. 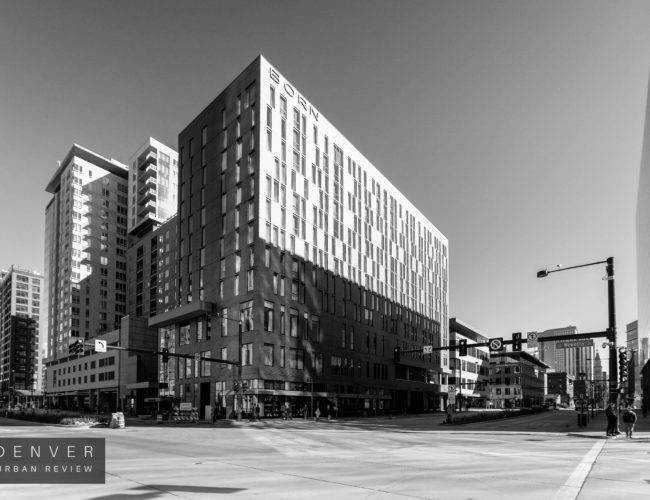 A deal was made between the City of Denver and the Triangle Building's developer East West Partners where underground parking for the building would be constructed underneath the Wewatta Street right of way as long as the developer placed a bike station on top of it. This was important because of the unusual triangular shape of the property. Triangular lots do not lend themselves to being ideal for underground parking structures. Liberty Global recently announced it will be leasing the top three floors of the Triangle Building. 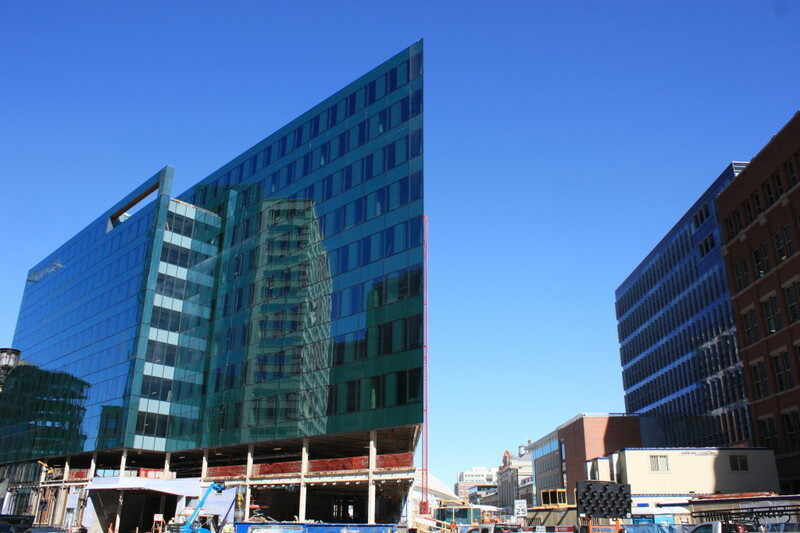 Above grade work is taking place on the 22-story 1401 Lawrence office project.National law firm Polsinelli has signed a 15-year lease to become the signature tenant of the building. 1401 Lawrence will have an outdoor space located on the 9th floor for its tenants. The dual brand Hyatt House Hyatt Place hotel March 2015. 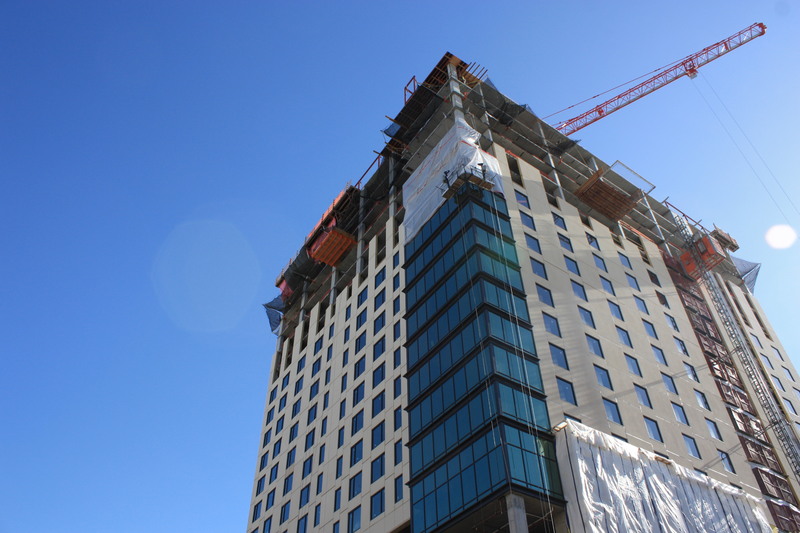 The dual brand Hyatt House and Hyatt Place hotel has topped off at 21-stories in the above photo. 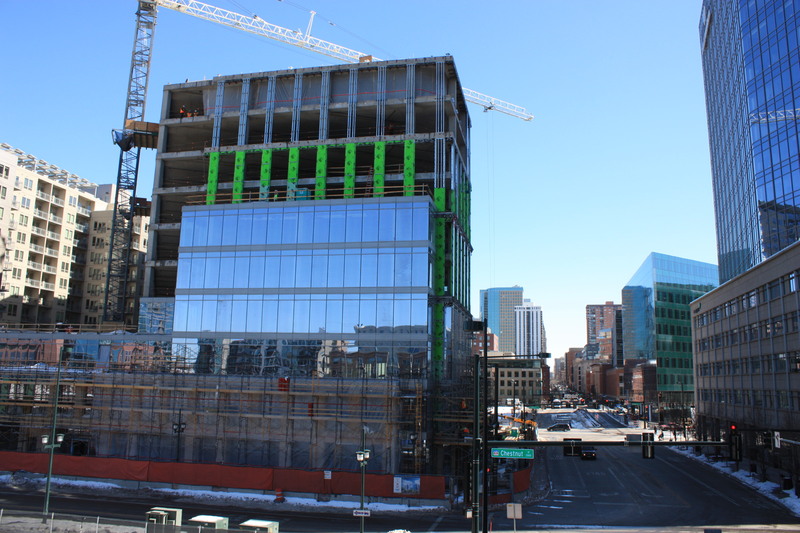 The 26-story SkyHouse Denver apartment project is underway at 18th Street and Broadway. 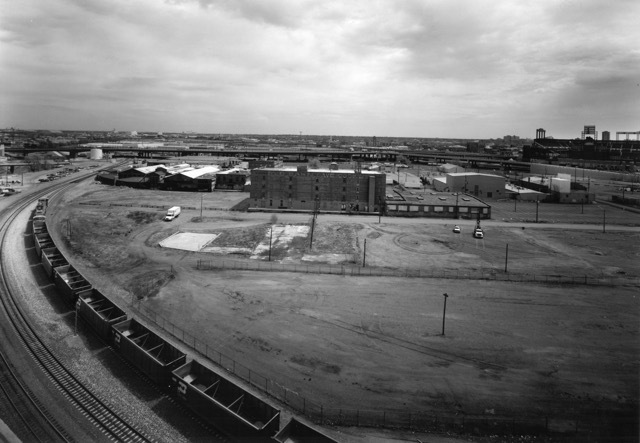 A photo looking northwest towards Denver's LoDo and Union Station neighborhoods. All of the prominent building on the horizon have been constructed this century starting with the Glass House residential towers on the far right of the photo. The next building to the left is the 21-story Platform at Union Station apartments and to the left of that is the 19-story office building- 1900 16th Street. 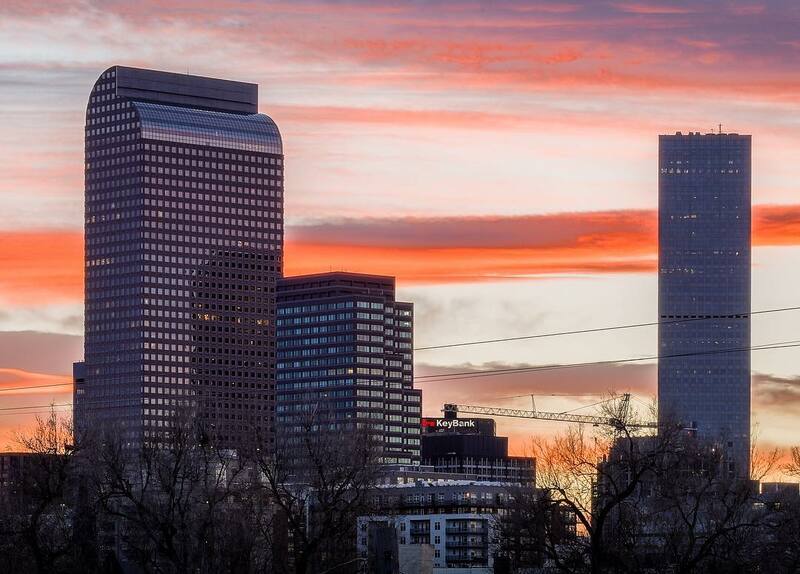 The photos in this set were all taken in March of 2015 by Denver Urban Review.